I’m making this film intuitively. It means that I am following my intuition on where I go, whom I film with, whom I choose not to film with, and how the film should be put together. I have only one rule with this film – that anyone who has anything to do with the film has to check in with their intuition to make sure it’s the right thing for them to do. 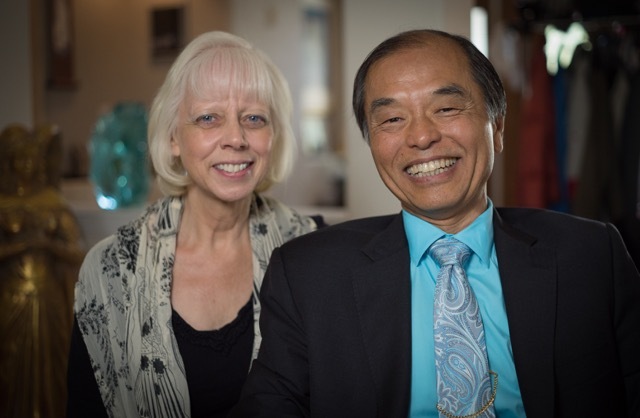 I did a wonderful interview with a highly regarded intuitive healer and psychic named Michael Tamura. Michael Tamura and his beautiful wife Raphaelle live in the lee of Mount Shasta. You can see the mountain through trees from their windows. Michael was a key figure at the Berkeley Psychic Institute for more than twenty years, and some years ago he and Raphaelle set up their own business teaching psychic and intuitive awareness. They hold seminars all around the world. When I left Australia I didn’t know who Michael Tamura was. Never heard of him. But this is how I’m making this film: I told James Van Praagh that I was going to Mount Shasta, and was there anyone there he could recommend I speak to. Immediately James said I had to speak to Michael. It turns out James wrote the foreword to Michael’s best selling book – YOU ARE THE ANSWER. And today Michael gave me a wonderful interview for the film, touching on areas that no-one else has broached. I made the decision very early on that I only wanted to interview true experts – working practitioners and researchers and authors. I didn’t want interpreters of knowledge, I wanted those with the knowledge, using it first hand. Michael is one such person, so to is James Van Praagh, as is Dr. Judith Orloff and Dr. Dean Radin, as is Dr. Norm Shealy and Caroline Myss. I’m getting a fascinating blend of views and perspectives from those throughout the world who really really know about intuition. These aren’t show ponies – these people are the real deal. I’m very excited by what I’m learning – and I’m learning more every day.